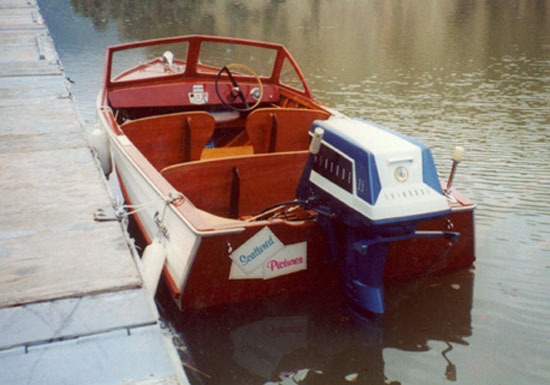 The Mariner 100 was the most basic version of Cruisers Inc. entry level boat. They produced four hulls between 13' and 19'. Taking a cue from the automobile industry, the company offered three different models for each length designated as the Runabout, Sportster, and Holiday. Cruisers' offered their boats in several colors and trim packages, though the vast majority were shipped with white hulls and stained mahogany varnished decks. Though technically the fourth owner, I am only the second to have the boat in the water. In 1959 a gentleman bought the boat at a Northern Wisconsin Cruisers Inc. dealer on the lake where he used it to fish with. It was bought on the condition that when not in the water, it was to be kept in covered storage at no charge. The salesman agreed, probably thinking the customer would trade it in for a larger boat at the end of the summer where he could end the free storage deal. No such luck. 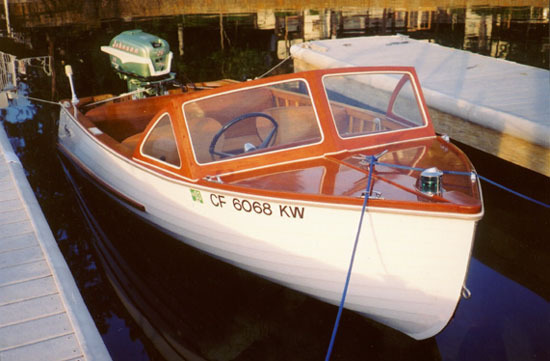 The boat was used one week every summer from 1959 through 1995 with the agreed storage arrangement, even when the dealership was sold to new owners. In the fall of 1995 the boat made its way to California. (A story onto itself) After two owners and and one honest attempt at restoring it, I took possession of it in the summer of 2000. I had her stripped, restained, along with several coats of varnish and paint. The hardware has been rechromed as well. a three mile per hour difference in top end speed. But then I don't know anyone who actually owns these boats for speed anyway!